Very Impressed ... We were very happy to stay here at Hanoi Ganet Hotel. Everything was very good from the location, hotel rooms, breakfast, internet and staff as well. More over is the crowded and romantic Hoan Kiem lake and West lake, which makes it perfect choice for both business or leisure foreign tourist. 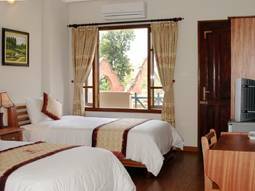 Garnet Hotel is also a new open accommodation. Considered a most reliable destination for any tourist or business person. It just takes 40 minutes from the Noi Bai Airport, 10 minutes walk to the Hoan Kiem Lake and 5 minutes to the West lake as well as a beautiful area to relax, visiting the night market in the 36 ancient streets, near the bank and many restaurants. Although our hotel is situated in the crowded old streets with many shopping but very quiet at night. New reopened Aug, 2008 Hanoi Eden Plaza hotel has become popular very quickly because of the high quality of service. The hotel has 7 floors with 23 rooms . 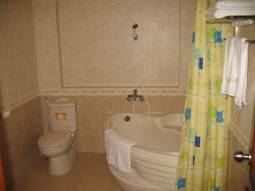 The rooms are well equipted with air-conditioner, private bathroom with hairdryer, hot water, IDD telephone, refrigerator, free ADSL internet connection, cable TV, decorated appealingly, queen size bed , King size bed and twin bed. 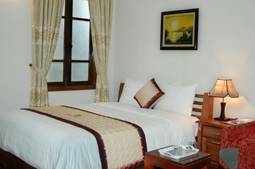 New reopened March, 2009 Hanoi Garnet hotel has become popular very quickly because of the high quality of service. The hotel has 7 floors with 19 rooms . 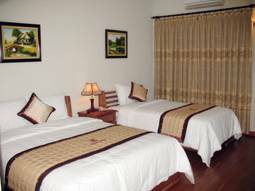 The rooms are well equipted with air-conditioner, private bathroom with hairdryer, hot water, IDD telephone, refrigerator, free ADSL internet connection, cable TV, decorated appealingly, queen size bed , King size bed and twin bed. * If you go to our Hotel by taxi from the airport, please talk with the taxi driver that you want to go to the GARNET HOTEL at No. 39 Nguyen Truong To str, Hanoi. Please look at GARNET Hotel’s logo with red colour (same in our web site) at the top of the door because some time the taxi driver want to take you to the other Hotel. just takes 40 minutes from the Noi Bai Airport, 10 minutes walk to the Hoan Kiem Lake and 5 minutes to the West lake as well as a beautiful area to relax, visiting the night market in the 36 ancient streets, near the bank and many restaurants. Although our hotel is situated in the crowded old streets with many shopping but very quiet at night.